Soccer field for league play as well as pick up games. Calendar of reserved times can be viewed under the 'Events Calendar' from the menu bar and select 'Soccer' category. The DeerLake Baseball and Soccer Fields are for DeerLake residents and their guests. Fields are available on a first come, first served basis unless a preset scheduled practice time is reserved in advance. Interested parties must be present at the meeting in order to draw a number which will determine who selects their practice time first, second and so on. Once this is finished we will select practice times. Practice Time is defined as a two hour slot, usually beginning at 4:00 PM Monday-Friday. There are typically two time slots per day available (4:00-6:00 and 6:00-8:00). Saturday and Sunday are reserved for walk on play and cannot be reserved. There is a two hour time limit for walk on play if someone else is waiting to use the field. 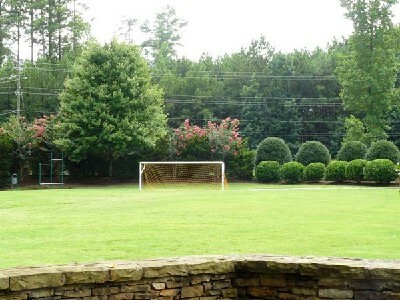 The Soccer Field is used by JCUMC league play on Saturdays in the Spring and Fall and cannot be used during those times. Only one time slot per team will be available until everyone has selected their time. If additional times are available and more than one team wants an additional time, we will hold another drawing to determine selection order for the second time slot.